Children will love visiting this world-renowned toy store, located in the heart of London on famous, bustling Regent Street. 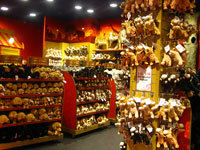 Hamleys is one of the world's largest toy stores, with six floors of magical, cutting-edge toys and games. The store draws over five million visitors each year and is worth a look even if you're just browsing. The Lego collection at Hamleys (located in the basement area) must be seen to be believed. There are helpful and entertaining service staff all over Hamleys eager to show off new toys and play with the kids - the only difficulty for parents is getting out without buying numerous presents.